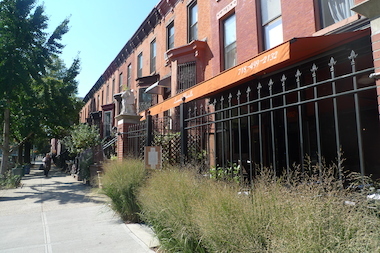 Mariella restaurant is on Sixth Avenue and 12th Street. A young man who was stabbed in the back collapsed in front of the restaurant on Sept. 27, witnesses said. PARK SLOPE — Police are investigating four stabbings that took place just around the corner from mayoral candidate Bill de Blasio's Park Slope home last Friday night. The four victims were all expected to survive the attacks, which happened about 11:30 p.m. on Sept. 27, along Sixth Avenue between 10th Street and 12th Street, police said. De Blasio and his family live on 11th Street near Sixth Avenue. "It's deeply troubling," de Blasio said in a statement. "I'd urge anyone with more information to come forward to the police." The victims were a 16-year-old who was stabbed in the forehead and the torso; a 19-year-old who was stabbed in an unknown location; a 20-year-old stabbed in the hand; and a 22-year-old stabbed in the back. All were hospitalized in stable condition, police said. An investigation is ongoing and cops are looking into whether the violence was gang related, a police spokesman said. Police did not provide details on what led up to the violent outburst, but witnesses said the stabbings seemed to be part of a larger fight between groups of young men who scuffled as they ran through the neighborhood. A resident of Sixth Avenue and 11th Street saw the aftermath of one of the stabbings from his apartment window. The young man who was stabbed in the back staggered across Sixth Avenue and collapsed in front of Mariella, a restaurant that was closing up for the night, said the resident, who did not want to be named. The resident, a 37-year-old man who's lived in the neighborhood since 2009, raced over to find the victim with a deep stab wound on his back and another on his head. "It was like someone had dumped a bucket of blood on his head," the witness said. "It was really gruesome. I didn't think he would make it." Another person who saw the stabbing victim said he seemed dazed, but was able to say "thank you" to a passer-by who took off his shirt and pressed it into his wounds. That witness, a manager at nearby Bar Toto, said a group of young men had raced down 11th Street a few minutes earlier, knocking over a sidewalk sign and a chair in front of the bar. "I thought it was just kids horseplaying," the bar manager said. A few moments later a bar customer spotted the group "piling up" on one man, who later turned out to be the victim who was stabbed in the back. The bar manager said some witnesses were afraid to talk to police, but he encouraged locals to contact cops. "We need to let them know we don't want [criminals] here, and they're not safe doing their crimes here," the manager said. The incident was a shock to residents and shopkeepers on Sixth Avenue, a sleepier strip than Park Slope's busier Fifth and Seventh avenues. "In any city you're going to get crime, although you wouldn't expect that to happen in Park Slope," said Patrick Schubert, co-owner of Mariella. "I was shocked and surprised." Violent crime is relatively rare in 78th Precinct, where property theft is the most commonly reported crime, according to NYPD statistics. There were two shootings in 2012, and one so far in 2013. Felony assaults have dropped 8.2 percent in 2013, with 61 reported this year compared with 56 in 2012.